Cryptocurrencies (digital currencies that operate independently of centralized banks – using encryption techniques to regulate the generation of units of currency and verify the transfer of funds) were first created in the wake of the global financial crisis of 2008 by the inception of Bitcoin. Since the creation of this revolutionary new currency type, over 1000 cryptocurrencies have been created. 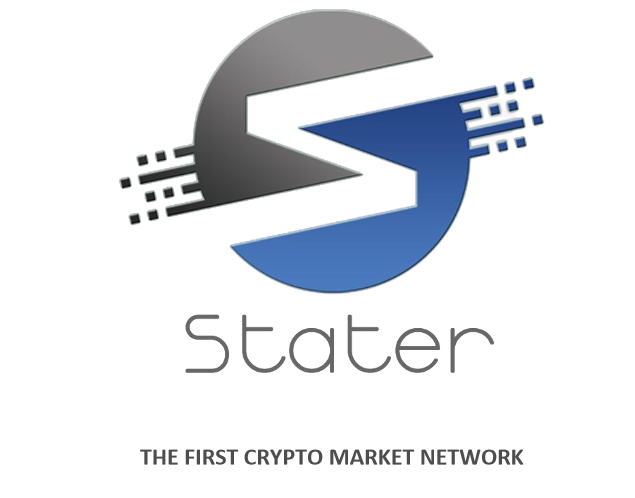 By introducing two market platforms and a new global mobile form of payment, Stater will shape the future of cryptocurrency as we know it. Security, simplicity, and speed are to become the hallmarks of Stater transactions. Stater aims to become the first crypto coin that will familiarize the world to the cryptocurrency revolution by introducing two crypto platforms directly to the general public. The first will promote P2B (peer to business) transactions via the website Staterspots.com, while the second will enable P2P (peer to peer) transactions through Statermarket.com. Both will use the new Stater coin. Complementing the two networks by 2018 will be a total of six mobile applications (3 Android and 3 iOS). Our P2B platform Staterspots.com will be dedicated to businesses that accept Stater as payment, while Statermarket.com will be dedicated to P2P transactions. Each platform will have its own Android/iOS mobile application allowing users real-time access to new listings in the market. 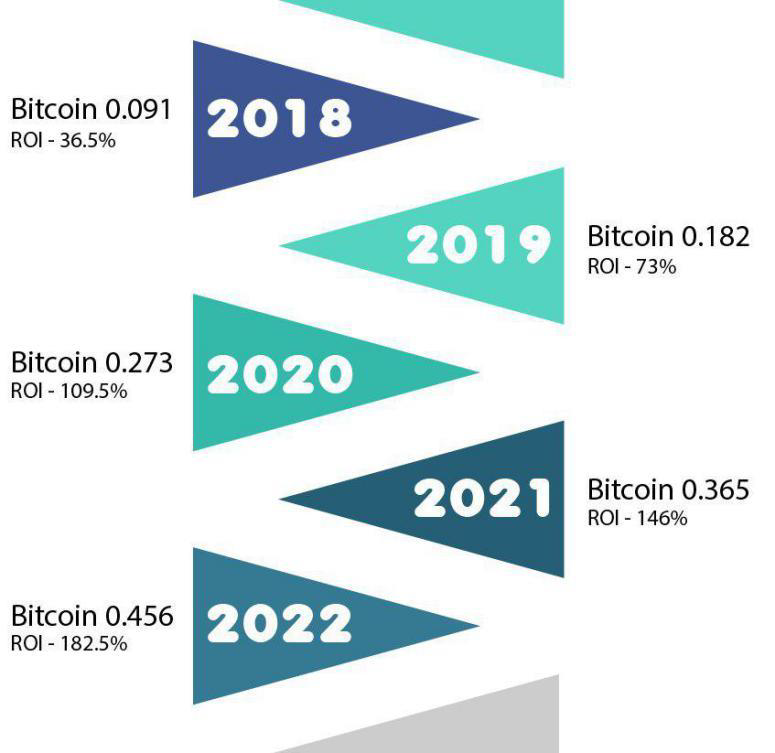 It is widely recognized that the vast majority of the general public are still relatively unaware of the existence of cryptocurrencies, let alone the advantages and investment potential of such currencies. Our team is of the belief that cryptocurrencies are the future of capital. Like the internet revolutionized the spread and speed of information, cryptocurrencies will likewise disrupt the financial status quo. The fundamental issue facing cryptocurrency owners is the inherent difficulty of utilizing a digital currency- how are they able to purchase goods and services using this new form of payment? Furthermore, the exchange that is required to transform their digital currency into fiat, or vice versa, involves unavoidable transaction fees that can often be prohibitively high. exchange makes it clearly apparent why cryptocurrencies are not yet a mainstream method of payment. Stater aims to overcome these issues with the creation of a mobile application that would allow for direct real-time transactions. Gone is the need for an exchange into a fiat currency – Stater coins would be used to settle the transaction instead and the normal fees are thereby avoided. The solution will be realized by the creation of the two aforementioned platforms – Staterspots and Statermarket. Staterspots will allow businesses to list themselves and their products while Stater users can use this site to locate and browse products. A special location function in the mobile application will allow users to ‘spot’ businesses accepting Stater in their immediate vicinity. Statermarket is designed to function as an online marketplace for P2P transactions. It is envisaged as a local market on a global scale where buyers and sellers do business using Stater as payment. 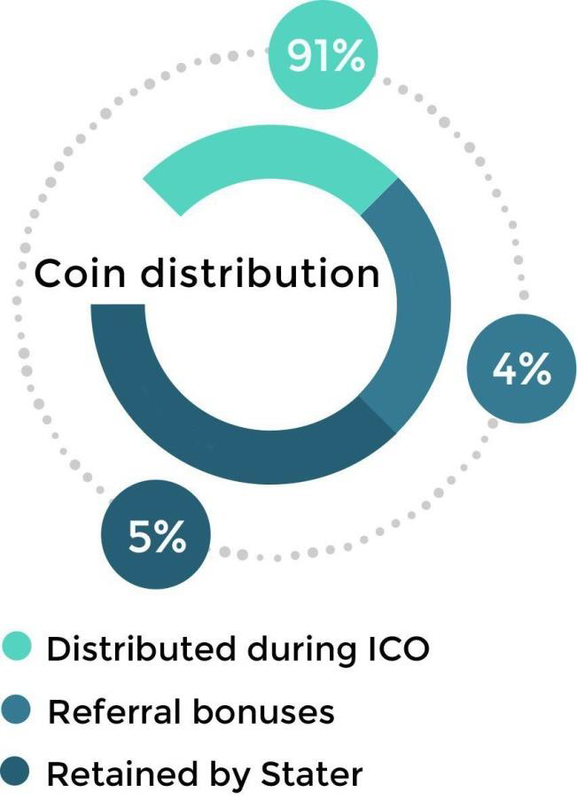 Stater will have a fixed minimal transaction fee of 0.5% which ensures both businesses and individuals retain the agreed price. The Stater application is designed to allow individuals and businesses to transfer Stater in a swift and secure manner. Since users will not need to wait for confirmations the ability to pay or receive payment is instant. In order to provide the user with a full set of application controls, the application will come equipped with high integrity safety layers. The Stater application will be released on the Android operating system first, followed later in 2018 by an iOS version. Staterspots.com will come with its own native and dedicated mobile application allowing individuals to locate businesses that accept Stater as a form of payment. Additionally, a business that is listed on the Staterspots platform will not only receive (free) local exposure but also benefit from the market opportunities arising from such a listing. such a form of payment has also increased. Unfortunately, the majority of businesses not only lack the knowledge and tools needed to accept such forms of payment but are also unaware of the advantages of such transactions. Staterspots.com will seek to close this knowledge gap through focused marketing campaigns aimed to educate those about the benefits of accepting Stater as a form of payment. Lastly, Staterspots.com addresses the issue of bringing those owning cryptocurrencies and wishing to use Stater for purchasing goods and services from listed businesses–together onto one viable platform. Buoyed by the exponential growth of P2P buying and selling over the recent years, we at Stater believe this is a trend that will only continue into the future. In order to facilitate the bringing together of those wishing to buy or sell using Stater- in a safe and ease of use environment - Statermarket.com was conceived. Statermarket.com is a platform dedicated to cryptocurrency users who are willing to sell their new and/or used products locally on a market style website. Statermarket users who would like to offer their products can easily list or update them online and set a Stater price. A meeting using the encrypted chat function - initiated from either within the website or via the Stater app - can be used to arrange the exchange for Stater. Adjustments to the local currency on the day of payment can be instantly made via the app. We believe the platform will be of great benefit to both parties. The seller will receive Stater - while the buyer has the opportunity to pay for goods and services in Stater - without the usual remuneration loss when exchanging to fiat. Statermarket.com will be available on both Android and iOS applications – making listing and browsing user-friendly and readily accessible. Stater coins can be used via the mobile application to transfer funds, buy products or services, or for those wishing to invest long-term- simply acquire and hold. We are of the opinion that Stater-with its two networks and six applications to support it- will become an eventual valuable asset. Being the first cryptocurrency to introduce two online market platforms – enabling both the ability to buy and sell in Stater via Statermarket.com or list as a business and be found via Staterspots.com – Stater will seek to solve THE major problem facing the crypto community today. As seen in the graph below, Stater’s value is set to increase incrementally every following year. Stater is designed as a full PoS (proof of stake) cryptocurrency, offering a strictly limited number of Master and Meganodes. A maximum of 100 Meganodes and 1500 Masternodes can run simultaneously at any given time and if one Masternode or Meganode leaves the network can another take its place. In order to set-up a Meganode, a Stater holder needs a minimum of 10,000 STAT and a private key. To form a Masternode, a Stater holder needs a minimum of 1,000 STAT and a private key. Nodes and keys will be available to early investors in the ICO. Should anyone miss the opportunity to purchase either of these Nodes during the ICO, the ability to request a private key will be available via the website statercoin.io. A ‘first come, first served’ rule is in operation and the moment a node becomes available, those registered are contacted in descending order via an email – containing detailed instructions and a seven-day period in which to set-up a Meganode or Masternode. The team at Stater has developed a rewards system that divides the creation of new Stater coins between Masternodes and Meganodes. 100% of the new coins will be generated by the nodes of which 10% is dedicated to the governance system. The rewards system will start with a ratio of 1 Stater per day for Masternodes and 15 Stater per day for Meganodes. 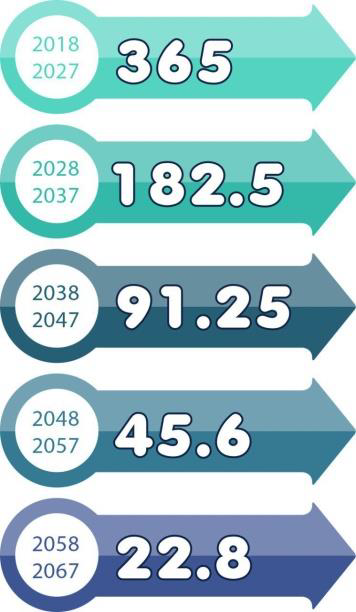 The return ratio will remain stable for the first decade, rewarding each holder of nodes with the same amount of Stater coins. 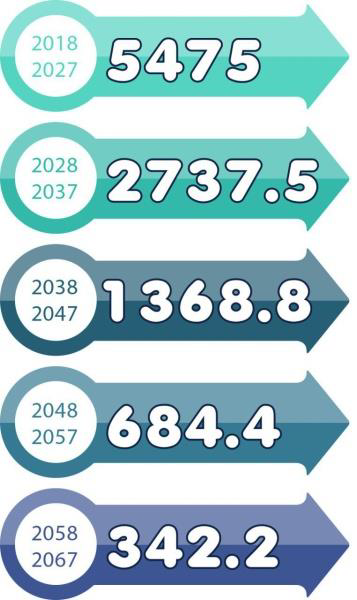 Rewards will automatically decrease by 50% with each following decade. The underlying reason for the creation of a limited amount of nodes is to ensure that our initial investors have a stable and guaranteed return of rewards in the following years. The ICO price is 1 STAT = 0.00025 BTC. form a Meganode. With ICO price, the ROI will be 1.368 Bitcoin annually. will receive annually for the first 5 decades. will be 0.091 Bitcoin annually. 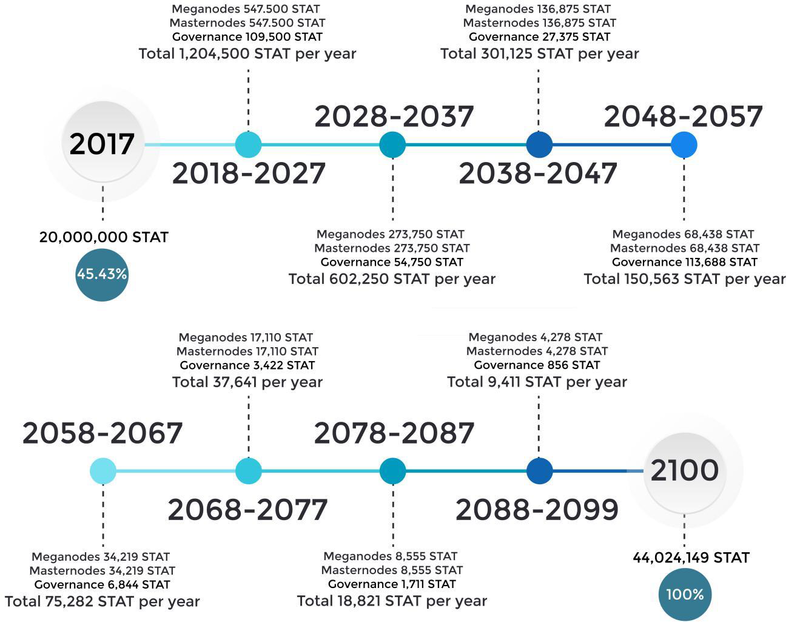 Shown in the chart below is a detailed breakdown of Stater’s roadmap for the yearly generation of coins for each node - and the rewards (in coins) for each Meganode, Masternodes, and Governance. Stater using a minimum amount of Bitcoin (0.01 BTC = 40 STAT). Coin Issuance: Initially, to your website account and after ICO to holders wallet. remaining -these will be used towards future development. Escrow for the raised fund: Yes, BTC multisig 4/5 Wallet. Masternode holders are able to vote at what will be implemented by Stater’s developers. 50.1% of the Masternode-Meganode network before they can be actioned and implemented. transparency and security are hereby guaranteed. The ICO balance will be released via a Bitcoin multisig wallet ‘4 out of 5’ arrangement. below for the proposed allocation of raised funds. public and increasing its global exposure. any legal obligation the project may face. alongside the purchase of necessary hardware/software. worth of social media and e-commerce experience, the Stater project is Andy’s brainchild. execution of the Stater project. over 60 projects to the table. responsible for the development of the overall Stater network and wallet. and technical manager of RM-Group. most Stater team members, Yannis has participated in various web application projects. applications for the Stater network. promote Stater on a global scale. Veniamin is the experienced sales manager in charge of Stater’s business development. range of international expertise in all related disciplines. committed focus to the success of Stater. the owner of a marketing consultancy business in the Balkans.